Support Frankfort's efforts to create and improve walking and biking trails with the purchase of this tee shirt. Printed on a charcoal cotton tee, this shirt is perfect for anyone. Please specify the size you want in the Comments section when you checkout. 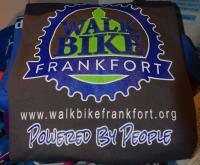 And thanks for supporting Walk/Bike Frankfort!